Deploy a dockerised web app over HTTPS with letsencrypt. This repo uses docker-compose so you'll need to install that if you dont have it. 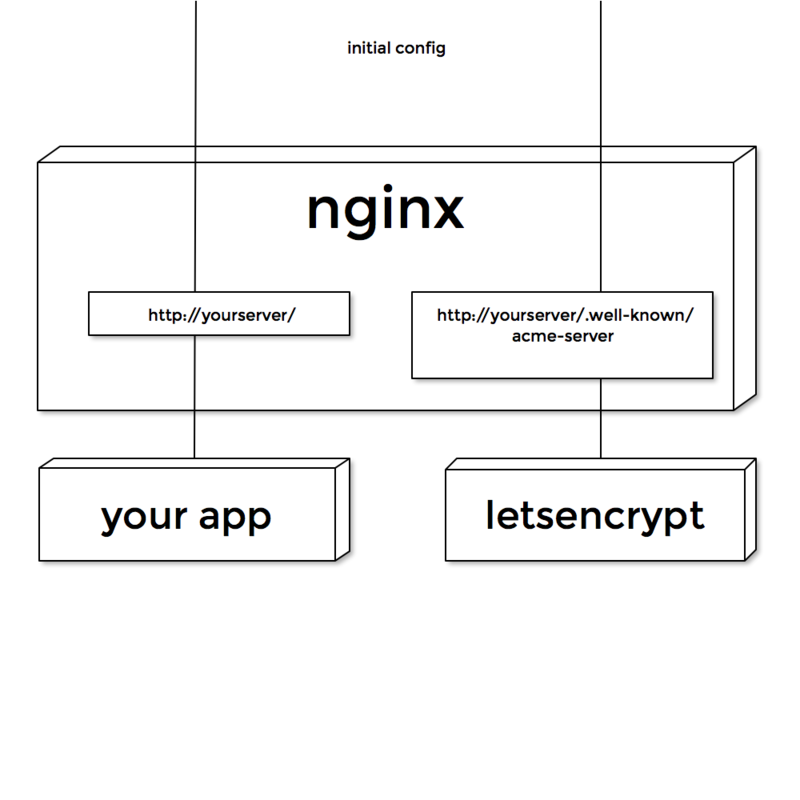 When you bring up the service with docker-compose up, docker compose starts an nginx reverse proxy, your app container, and the official letsencrypt container. The initial config allows letsencrypt's acme challenge to get to the letsencrypt container. The letsencrypt container runs in standalone mode, connecting to letsencrypt.org to make the cert request and then waiting on port 80 for the acme-challenge. 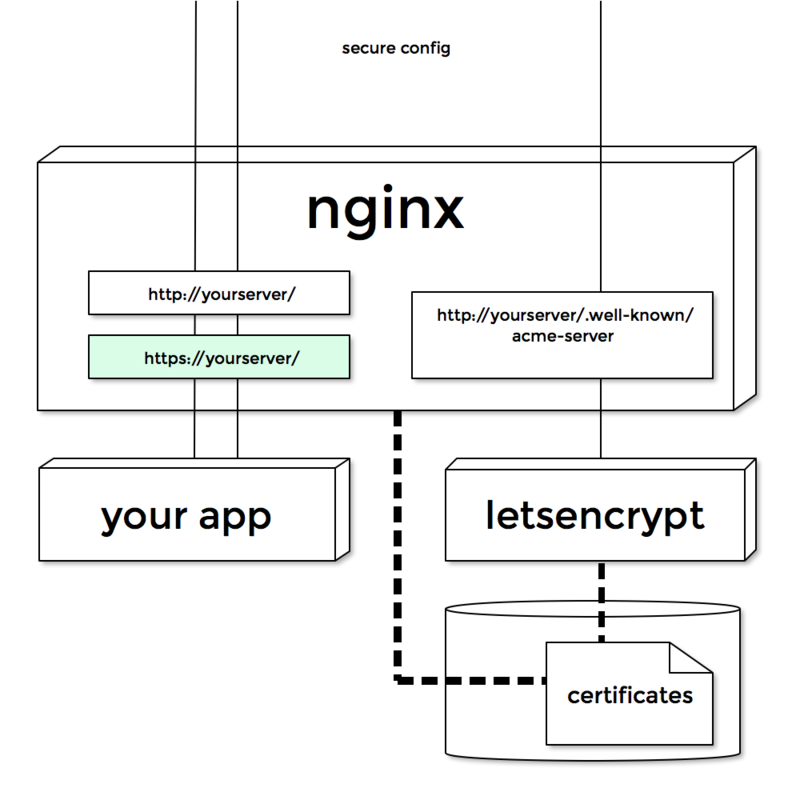 When letsencrypt issues the challenge request, the le client writes the certs to /etc/letsencrypt, which is a volume mounted to the nginx container. The nginx container's init script notices the certs appear, and loads a new config, setting up the https port forward. The service is now running over https. You need a docker server running on the public internet, with a DNS entry pointing at it. If you dont have this yet, use the other repo in this series . An example app is now running securely. Try it with your browser! The letsencrypt container exited - this is what we want. To use this with your own dockerised web server, edit docker-compose again. Start the letsencrypt container with docker compose. The container starts, runs the acme process, and exits.